Firefighting and quick thinking are clearly in the veins of 14-year-old Joseph Nikisher. Which isn’t surprising, considering he’s the son of Mahopac Fire Department Chief Bill Nikisher. The youth is being heralded for extinguishing a series of fires that suddenly broke out inside his family’s residence earlier this month. He was home alone, and his quick thinking likely saved the structure. 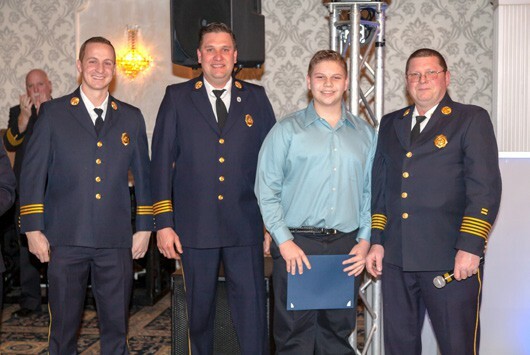 Joseph Nikisher was honored by the fire department with a special Certificate of Appreciation at the agency’s annual installation dinner Saturday evening in Mahopac. Joseph’s heroics took place on Jan. 20 in the aftermath of Winter Storm Harper when fire companies countywide answered dozens of alarms for storm-related matters. The chief cleared the scene from the previous emergency call and responded to his own home accompanied by the department’s brush truck. When he arrived on the scene and observed smoke pouring from the residence, he sounded a general alarm and reported a structure fire. An investigation revealed that when the transformer malfunctioned, 13,000 volts of electricity were sent into the residence. The intensity was so severe that a NYSEG meter actually became welded to a meter pan. Inside the residence, multiple fires broke out that resulted in several appliances, outlets and wires being destroyed. When the fires erupted, Joseph grabbed a portable extinguisher and doused the flames, preventing the entire house from going up in smoke. The fires caused considerable damage, nevertheless, and the residence was deemed to be uninhabitable. Joseph’s quick action may well have resulted from his genes since not only is his dad a veteran career firefighter but his brother and sisters, John, Elena, and Rosemarie, are members of the Mahopac FD who recently graduated from the county’s Fire Training School. Sister Elena also is a member of the MVFD. Chief Nickisher Monday said he was “extremely proud” of his son. “He had the presence of mind to take the extinguisher and put out separate fires both upstairs and downstairs,” he said. The chief encouraged all residents of the county to purchase not only smoke and carbon monoxide detectors but a fire extinguisher as well. “Teach every member of the family to learn not to burn and what to do in the event of an emergency around the home,” he said.